I'm trying to setup my Onion Cloud, but when i click on the button [Setup Device] on [Cloud Setting] i've been received with this message: [Error]: Setup code is invalid. I try to put [Blank] or [Device ID] generated by Onion Cloud (attached picture) there is no difference in the return message "Setup code is invalid". In the upper right corner, you have to generate a code, it is NOT the Device ID. @Jim-Esposito Yep, you have to generate the Setup code in the Cloud device page. Can you show me or put the steps to get the code? TKS! I Found... :-) There is a problem when i changed the name or put another name different of omega-xxxx. It's strange the shared device list, i can't remove and i don't understand why this device "onion" goes to this list... Well, thanks for you help! @Fabiano-Anjos Did the device always show up under Shared with Me? Or did it show up under My Devices ever? Did the device always show up under Shared with Me? Or did it show up under My Devices ever? @Fabiano-Anjos Ah ok, I see. The 'Share Device' functionality is meant to share your device with other Onion Cloud users. Do not use the 'Share Device' to share the Device with yourself! When you create a new Device, you are the owner of that device and have full administrative privileges. 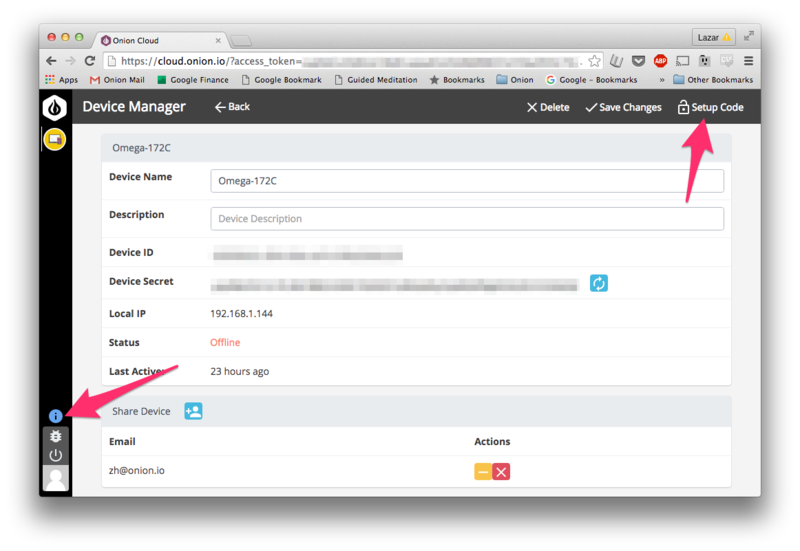 Try creating a new Device on the cloud and using the Setup Code to connect it with your Omega. Then you should be able to see it online. @Lazar-Demin you are right! tks for your help!